Two-speed drive gearbox; cuts at speeds of up to 60 mm/min. The Excalibur Pipe Cutting and Beveling Machine is able to cut pipe wall up to 2″ (50 mm), bevel high tensile stainless steel pipes, and work in the most extreme temperatures. Available in Hydraulic, Pneumatic, or Electric driven options, the Excalibur machines will cut and bevel most machinable materials, including carbon steel, stainless steel, ductile iron, cast iron, and most other alloys without spark or flame. 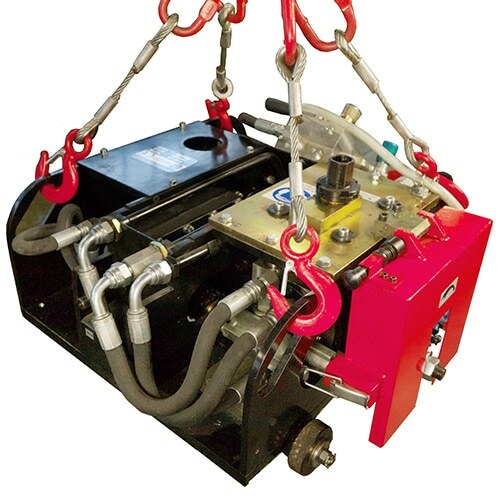 The heavy duty chain tensioning mechanism, encased in a high strength alloy frame provides the necessary rigidity and strength for cutting the pipe at the highest travel speed possible. The frame of the Excalibur has six wheel positions to better follow the radius of the pipe and allow tracking accuracy on a 36′ pipe of better than 0.3 mm. The Excalibur is equipped with a two-speed drive gearbox, which provides positive movement of the machine around the pipe in all kinds of pipe cutting conditions. No out-of-round compensation is needed, as the machine follows the pipe’s outside diameter, producing an even and consistent cut. The drive chain can be shortened or lengthened to accommodate pipes from as small as 6″ up to 5-meter diameter vessels and beyond. Able to work on site, off shore, in the field or even underwater (requires optional corrosion proofing), the Excalibur provides a versatile solution for almost all cutting and beveling applications. The hydraulic driven Excalibur machine is designed for cutting heavier wall, high alloy pipes, or particularly tough steel applications. The closed loop hydraulic system ensures proper lubrication is applied to the drive motors, which extends the life of the machine. The dual hydraulic motors are infinitely adjustable and deliver consistent horsepower to the cutting blades and drive motors. Two hydraulic motors drive the Excalibur. A 4KW hydraulic motor coupled to the heavy duty transmission rotates the cutting blades up to 76 RPM. A 1KW motor connected to the two-speed transmission moves the machine around the pipe. Due to the extreme performance of the Excalibur, the hydraulic version must be used with a Power Pack capable of delivering 72 ltrs/min at 100 bar pressure in order to achieve maximum results. The pneumatic driven Excalibur machine is an excellent tool for both field and shop work. It is best used for cutting pipes in explosive environments such as refineries, or on pipelines conveying natural gas, crude oil or crude oil by-products. 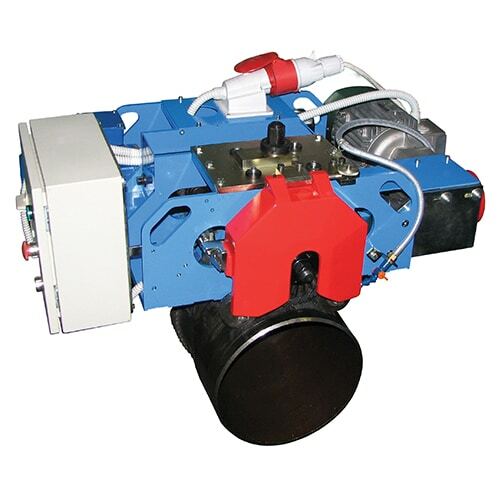 Machine speed and blade RPM are controlled by means of two metering valves located on the control block. Airflow to the main drive motor and the blade motor can be shut off simultaneously with the start/stop control valve, located on the control block. Two highly reliable, heavy duty pneumatic air motors drive the Excalibur. A 2.75 KW motor coupled to the heavy duty transmission rotates the cutting blades at up to 71 RPM. A .56 KW motor connected to the two-speed transmission moves the machine around the pipe. Beveling blades are available in various configurations such as 30°, 37.5°, bevelling angle, as well as “U” joint and “J” prep. Due to the extreme performance of the Excalibur, the pneumatic driven version requires a compressor capable of delivering a minimum of 10 bar at 4000 ltrs/min in order to achieve maximum results. The electric driven Excalibur machine is designed for use in non-explosive environments. When being used in a fabrication shop or yard to cut new or non-explosive pipes, the electric driven machine offers unbeatable performance. 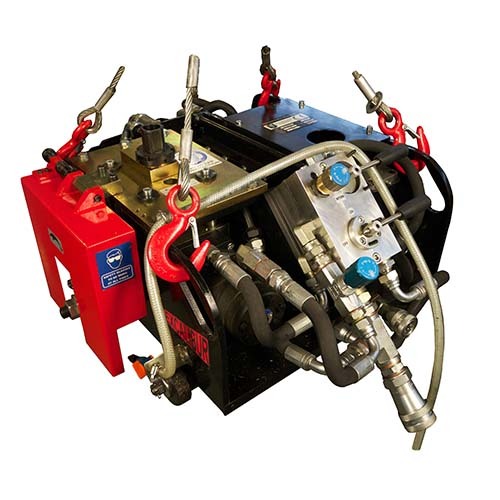 Running off 3 phase electric supply and powered by 3KW and 3.5KW motors, the electric driven Excalibur machine is capable of cutting pipe of 1″ wall thickness at a rate of 30mm per minute. The electric driven Excalibur machine is a cost effective solution, as it does not require a compressor or power pack like the pneumatic or hydraulic driven versions. As such, if you will not be working in explosive environments, the Pipeswizard® electric driven Excalibur machine offers unrivaled performance, durability, and cost.